This project is a table of contents for all projects relating to this County of West Virginia. Please feel free to add profiles of anyone who was born, lived or died in this county. 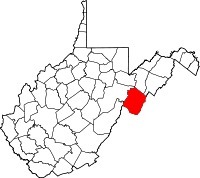 Pendleton County was created by an act of the Virginia General Assembly on December 4, 1787 from parts of Augusta, Hardy and Rockingham counties (Virginia). It was named in honor of Edmund Pendleton (1721 - 1803). Edmund Pendleton was born in Caroline County, Virginia on September 9, 1721. He studied law and was admitted to the bar in 1744. In 1751, he served as a justice of the peace and was a member of the Virginia General Assembly from 1752 to 1774. He was President of the Virginia Convention of 1775 and 1778 (that ratified the US Constitution), represented Virginia in the Continental Congress (1774-1775), and served as the Governor of Virginia (1774-1776). He later served as the President of the Virginia Court of Appeals. Judge Pendleton died on October 23, 1803.